(Phys.org) —A trio of researchers in Sweden has unearthed a fossilized fern that has been dated to 180 million years ago, that remarkably, is in near pristine condition. Benjamin Bomfleur and Stephen McLoughlin, of the Swedish Museum of Natural History and Vivi Vajda of Lund University, report in their paper published in the journal Science that they discovered the fossil in a bed of volcanic rock near Korsaröd in Sweden, and found it so well preserved that microscopic analysis revealed that they could make out its DNA structure. The calcified stem of a royal fern dating back to the early Jurassic period was apparently preserved by mineral precipitation from hydrothermal brines as they rapidly crystalized, trapping the fern, which was clearly alive at the time, encasing it in an airtight environment. Although very small (just 5.8 x 4.1 cm) the fossil was so well preserved that the researchers were still able to make out cell cytoplasm, nuclei and even chromosomes. 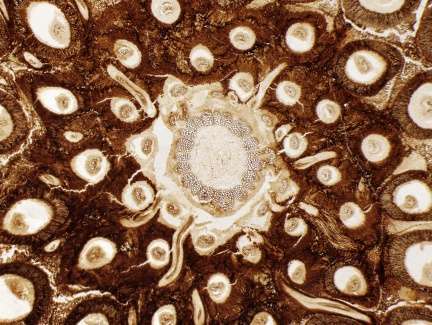 Curious, the team measured the sub-cellular parts of the fossilized plant and compared them to those of a modern relative, the cinnamon fern (Osmundastrum cinnamomeum), which has already earned the title of a "living fossil" due to prior research that revealed its origins could be dated back to 75 million years ago. In so doing they discovered that the number of chromosomes and indeed the DNA content itself was a very close match—so close that the team dubbed them a "paramount example of evolutionary stasis." Remarkably, the plant hasn't changed much at all over a period of 180 million years. When it lived, it likely looked much like the bright green cinnamon fern (though they turn to cinnamon color later in life) of today, growing to a height of one to five feet with spreading fronds reaching six to eight inches. The team suggests the specimen provides exceptional insight into how life can evolve over geologic time. Finding a plant in such pristine condition is rare, of course, as the researchers note, ferns are part of a group of some of the oldest types of plant families on the planet, going back approximately 360 million years. Rapidly permineralized fossils can provide exceptional insights into the evolution of life over geological time. Here, we present an exquisitely preserved, calcified stem of a royal fern (Osmundaceae) from Early Jurassic lahar deposits of Sweden in which authigenic mineral precipitation from hydrothermal brines occurred so rapidly that it preserved cytoplasm, cytosol granules, nuclei, and even chromosomes in various stages of cell division. Morphometric parameters of interphase nuclei match those of extant Osmundaceae, indicating that the genome size of these reputed "living fossils" has remained unchanged over at least 180 million years—a paramount example of evolutionary stasis.